My husband and I have the crazy vision of buying a house someday in the San Francisco Bay area. When I feel restless about this formidable goal, I start scheming up ways to make more money on the side. Last year’s attempts included self-publishing a book, dog-sitting (which involved trying to calm down a barking dog while fielding complaints from neighbors), and decorating and reselling furniture I found on the street. Those were interesting, but I was looking for something new in 2017. To start the new year on the right foot, I decided to try walking around town delivering food with Postmates. It’s good exercise and has been much more enjoyable than some of my previous side gigs. On the other hand, buying a house still looks pretty tough. Like Grubhub, DoorDash and UberEATS, Postmates delivers food and other products from places that may not have their own in-house delivery services. If you live in a dense enough town, Postmates and DoorDash allow deliveries on foot. It’s easy to sign up to be a courier, and you can work as much or as little as you like. When you want to deliver, you turn on the app and wait for it to find a job close to you. Instead of paying for lunch, you can get paid to walk around with other people’s lunches. Last week, I took a break from the office and made $7.50 for walking an order of McNuggets a few blocks. For those who love to walk or have fitness goals, it’s a way to plug into the gig economy and get paid for doing something that you like. As someone who dislikes driving, I had previously thought that the gig economy world of ride-sharing and delivery services wasn’t for me. In fact, because I didn’t realize walking was an option, I wrote off Postmates when I first came across it in my weekly Funcheap newsletter last year. If you don’t mind driving, scooting or biking, those options are also available. At some restaurants, the client places the order ahead of time, so you can just go in, pick it up and continue walking. At others, though, you have to order when you get there (with a Postmates debit card), forcing you to wait in line and then wait for the restaurant to prepare the food. Fortunately, you get paid more for the wait time! It isn’t possible to see the customer’s location before you accept a job, so you can’t tell in advance which direction you’ll need to walk next. This prevents me from accepting jobs if I need to get back soon, since the job might send me in the opposite direction of my next commitment! The app will not assign walking couriers destinations outside of a reasonable walking radius, though. The most I’ve had to walk is about 15 minutes. Tipping is encouraged, but I’ve found that only about 21% of customers tip. The average tip among those customers was $2.87. It’s free to get started with Postmates, but you’ll need a smartphone to download the app (it’s compatible with Android or iPhone). Onboarding involves filling out a form online, which submits your information for a background check, and attending a brief orientation at a Postmates office. 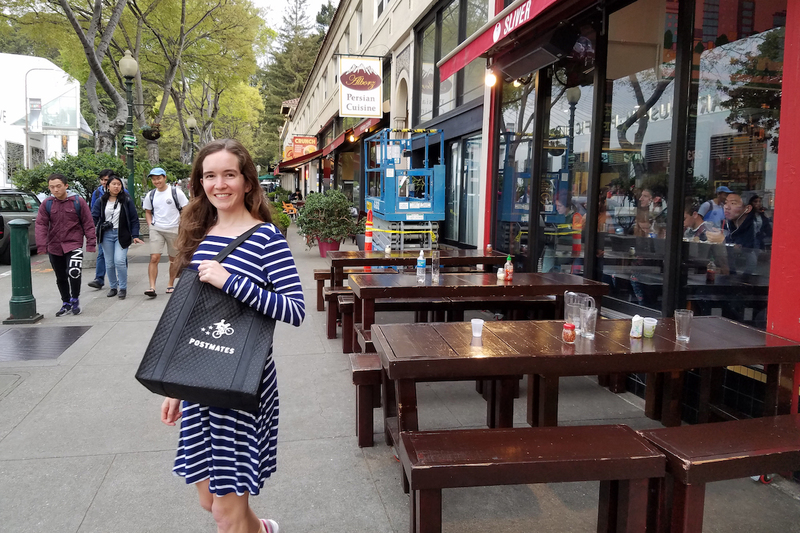 The orientation is about 15 minutes long and mostly serves to give you an insulated bag for carrying food and a debit card you use to pay for customers’ orders at restaurants. I went to an evening orientation, so it didn’t interfere with my standard work hours. It took me a few tries to get the little things down. For example, when a customer reached for the bag of food on my first day, I was still in the office mindset and thought he wanted to shake hands! I tried (and probably failed) to cover this up. I’m also still working out the best technique for carrying delivery items and an umbrella while using the app. How Much Money Can I Make Delivering for Postmates? Delivery payouts vary by city, and they increase based on the distance you travel to complete the delivery and how long you have to wait for the restaurant to fulfill the order. When demand is high — like lunchtime or during a downpour — Postmates increases payouts by a multiplier (up to 2x) to encourage more couriers to turn on the app. So far, my earnings per delivery have ranged from $4 to $10.53. All told, I’ve made about $150 doing 19 deliveries in my first three weeks, including a $20 sign-up bonus. At the speed I walk, this comes to roughly $15 per hour. Earnings are paid by direct deposit every few days, so if you deliver a few days per week, you’ll see a steady stream of income. If you’re an avid walker and a Penny Hoarder reader, you may have already set up your fitness tracker to reward your steps through programs like GymPact, Achievemint and Walgreens Balance Rewards for Healthy Choices. These programs reward you in PayPal payouts or in-store rewards points for walking. The payouts aren’t large, but since you’ll be walking to complete your deliveries, make sure to turn on these passive income streams. If you need a nudge toward that New Year’s resolution of getting your steps in, delivering with Postmates can help you meet this goal. According to my Fitbit, I am averaging 14,700 steps per day since I started doing deliveries, a 31% increase over the previous month. The distances between the restaurant and the customer have taken me anywhere from five to 15 minutes to walk. If you’re traveling in a city that uses Postmates, doing a delivery can help solve the age-old tourist’s dilemma: finding a restroom. The app will send you to a restaurant, and you can use the restroom as a paying customer while the food is being prepared. Then, walk the food to the customer, and voila! You found a restroom and got paid. Your turn: Will you add deliveries to your walking money hacks? Holly Gaston is an energy analyst in San Francisco. She enjoys finding ways to get paid for walking around the city.